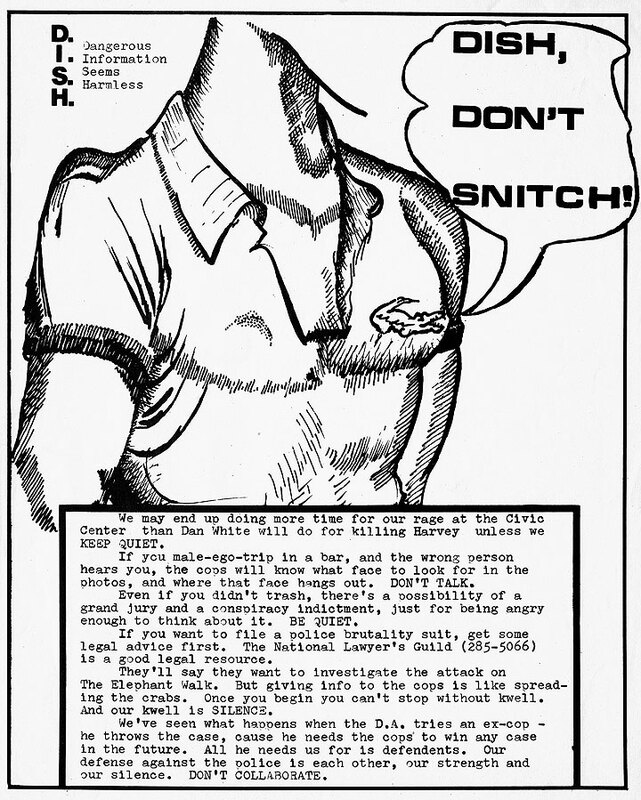 Difference between revisions of "DISH, DON'T SNITCH! : D. Dangerous I. Information S. Seems H. Harmless"
We may end up doing more time for our rage at the Civic Center than Dan White will do for killing Harvey unless we KEEP QUIET. If you male-ego-trip in a bar, and the wrong person hears you, the cops will know what face to look for in the photos, and where that face hangs out. DON'T TALK. Even if you didn't trash, there's a possibility of a grand jury and a conspiracy indictment, just for being angry enough to think about it. BE QUIET. If you want to file a police brutality suit, get some legal advice first. The National Lawyers' Guild is a good legal resource. 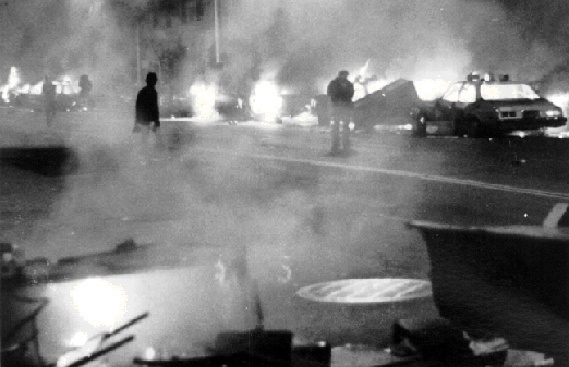 They'll say they want to investigate the attack on the Elephant Walk [at 18th & Castro]. But giving info to the cops is like spreading the crabs. Once you begin you can't stop without kwell. And our kwell is SILENCE. We've seen what happens when the D.A. tries an ex-cop--he throws the case, cause he needs the cops to win any case in the future. All he needs us for is defendants. Our defense against the police is each other, our strength is our silence. DON'T COLLABORATE.